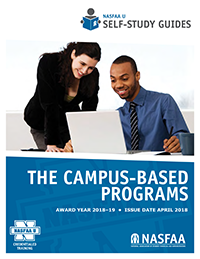 This guide reviews the provisions common to all three of the campus-based programs along with detailed information about the individual programs (Federal Supplemental Educational Opportunity Grant, Federal Work-Study, and Federal Perkins Loans). Identify provisions common to each campus-based program. Understand the program-specific requirements of the FSEOG Program. Become familiar with FWS community service requirements. Have a basic understanding of the Federal Perkins Loan Program, including counseling requirements and repayment features.